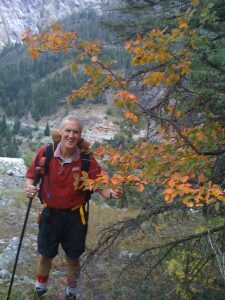 For some 40 years, Paul LeRoux has been hiking in the Ouray/Silverton/Telluride area. He has deeply fallen in love with this part of Colorado. During those many years, he had always thought that a mountain rescue book would interest tourists visiting the San Juans. Over the years, he got to know the fiction writer and Ouray resident Kent Nelson and became a huge fan of his work. He was convinced that Kent would be the perfect writer for a rescue book. He lived in Ouray, was familiar with many of the incidences and in my opinion is a superb writer. Unfortunately, he was always busy with a novel or collection of short stories. This past December, all the stars aligned. He had asked Kent for some advice on another book. During our conversations, Kent asked Paul if he was still interested in rescue book. He said, “Absolutely.” Kent then offered to try one story and see how long the research and writing would take. That test led to his agreement to pen the book. Paul is ecstatic with Kent’s book, Rescues and Tragedies in the San Juan Mountains. On top of his gripping descriptions, many colored photos add to the drama of this book. Why not download the free mountain rescue story and judge for yourself? Or better yet order the book! Are you traveling through gold and silver mining country in Colorado this summer? Then you’ll want to have a copy of Mines, Miners and Much More by your side to understand the mining structures, miners and and economic history of this fascinating area. 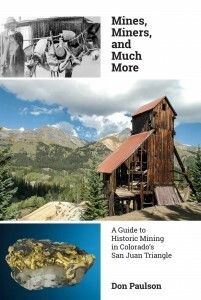 Twain Publishers is proud to announce the publication of the book Mines, Miners and Much More, It paints a broad, colorful picture of the history of gold and silver mining in the San Juan Triangle of Colorado. It is intended for those who want to see, explore and understand the historic sites remaining from the glory days of Colorodo prospecting.